This is the start of a strange relationship, one in which the lion has a calming influence on the old man. While the lion generally stays in Blumenberg’s study, he does venture out occasionally. On one excursion, he’s seen by a sharp-eyed nun, the only person apart from Blumenberg to do so. Shortly after his arrival, he ventures into Blumenberg’s lecture, and while he isn’t visible, four of the students sense something unusual in the room. Like the philosopher, the reader is perplexed by the lion’s presence – what on earth is going on? An easier place to start is with the four students, the only ones in the crowded lecture hall who seem to sense the presence of the lion. There’s the nervy Isa, a beautiful middle-class girl with a crush on the elderly professor; her boyfriend Gerhard, a brilliant student with a troubled past; Richard, a lazy ladies’ man with an urge to travel; and Hansi, handsome, unusual and obsessed with poetry. The longer the story goes on, the more we learn about the four, and leaving Münster, we follow their fates after the near-encounter with the professor’s mysterious companion. It’s perhaps no coincidence that they were able to sense the lion. You see, the four are connected by their future more than their past – all are in for a tough time. 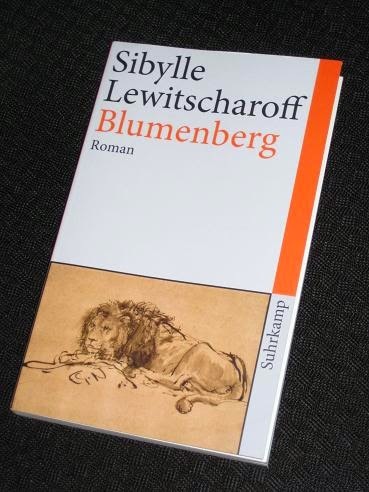 Blumenberg is a gentle, amusing book to begin with, and the reader will enjoy the bizarre appearance of the lion and Blumenberg’s grumpy old man, very quick to accept the appearance of his new companion. Lewitscharoff starts off with a gentle sarcastic tone, half mocking, half smiling at Blumenberg, and the other characters are introduced similarly. Isa’s intended gift of flowers to Blumenberg is one example of a humorous, farcical misadventure. After a lifetime spent grappling with philosophical matters, the arrival of the mysterious lion might be the biggest conundrum of all. It’s not giving much away to say that the novel ends in a much darker manner than the one in which it began. Blumenberg is a book which is both intriguing and puzzling, and it really takes a while to see where Lewitscharoff is going (I’m still not sure I got it completely). More than with most of the books I’ve read for German Literature Month, there was a distinct culture gap here, with the writer assuming shared knowledge of Blumenberg himself and the prevalent mental state of Germany in the early 1980s. I frequently had the feeling I was missing something hinted at between the lines. In addition, the narrative was interrupted twice by the intrusion of the narrator, foreshadowing events from the characters’ later lives. It all makes for a confusing read. I've just bought her latest book and was tempted by this as well. The way you describe it makes it sounds very interesting. A book that leaves you with more questions than answer. Maybe that has something to do with his philosophy? Caroline – Or all philosophy 😉 The only one in English so far is 'Apostoloff', and that comes highly reccomended. I'm sure I'll try another at some point as she's obviously a very good writer. No English translation? That's a shame because it sounds pretty good.